Intel's Cherry Trail Atom chips are almost here, and if you're in the market for an Intel-based tablet the future looks bright. 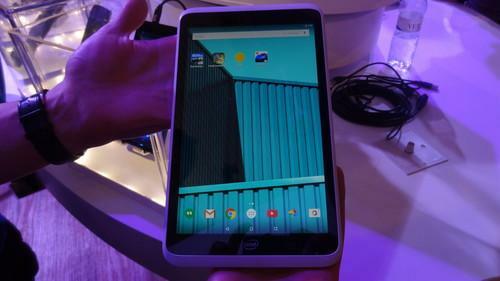 We briefly got our hands on what could be the first Cherry Trail tablet shown publicly -- an 8-inch prototype from Intel running Android with a variety of apps and games installed. The graphics in particular stood out. The game "Real Racing 3" took some time to load, but when it started the display kept pace easily with the fast-moving visuals. A previous Bay Trail chip in an Asus Transformer Book T100 struggled with demanding games, showing how far the Atom X5 and X7 chips, as they're known, have come. The tablet wasn't connected to the Internet, so we didn't get a taste of the Wi-Fi speed or how fast cloud applications will load. But other local apps fired up quickly. The tablet had USB 3.0 and HDMI ports and a audio jack. them in the first half of the year. Cherry Trail succeeds the current Bay Trail chips, which appeared in 2013. They're expected to go in some PCs as well, and Cherry Trail powered Microsoft's HoloLens augmented-reality headset when it was demonstrated earlier this year. The graphics with Cherry Trail are twice as fast as with Bay Trail, an Intel representative said. But the company has paid less attention to CPU speed and battery life, which will be about the same or slightly better than with Bay Trail tablets, according to Intel. The CPU core is based on a new architecture code-named Airmont. Cherry Trail tablets should be thinner, partly because the chip is manufactured on a 14-nanometer process, enabling smaller and more power efficient transistors. But how Cherry Trail devices will sell remains to be seen. Intel shipped more than 40 million tablet chips last year thanks to an aggressive rebate program offered to device makers. The tablet market is slowing down now, though, so it may be harder for Cherry Trail to match last year's performance. Later this year, Intel will include wireless charging with Cherry Trail, allowing tablets to be charged at compatible locations without a power adapter. Tablets will also be able to stream images wirelessly to displays through a technology called Wi-Di.